Yogesh Chabria - The Happionaire ​Blog - Best Motivational Speakers In India - Inspiration, Success: Ego, Arrogance and Overconfidence Kills! Ego, Arrogance and Overconfidence Kills! Around a year ago I was having lunch with a hedge fund manager based in London. He was managing a few hundred millions dollars and things were going pretty well for him. He had a great educational background and had worked with some of the best investment banks in the world before starting his own hedge fund. Our discussions were interesting, however he had never agreed with my belief in investing in value and following people like Warren Bufett. He started telling me how I should stop following ‘old fuddy-duddies’ like Warren Buffett and should move ahead with the times. These days it was all about advanced software and formulas which could give almost instant returns. I like sharing my ideas but don’t like imposing my ideas on anybody. It doesn’t make sense and is a waste of time. If somebody has decided that they know everything that is there to know, nobody can help them. The best way to learn and succeed is to know that we know nothing. There is an entire universe out there and still some of us think we can know everything. In the world of investing a few people after making some money tend to imagine they are invincible and great. This is the worst thing that could happen to any investor, because it surely means that the investor will end up taking unnecessary risks and end up losing everything. An investor will end up taking loans in hopes of making higher returns, and will end up forgetting the simple basics. Unfortunately last I heard from this hedge fund manager- his hedge fund had gone bust and things weren’t the same for him. I told him not to worry and tried to motivate and cheer him up. I hope and pray that he gets over what has happened. It is harder for somebody who has seen and been with money to go through such a phase, as they have become to certain privileges- expensive dinners, fancy cars and pricey houses. Personally I don’t feel too comfortable with too much extravagance, because I always think like an investor. My thought process doesn’t see a lot of value in a fancy car or a designer suit. Thinking like an investor always is very important to bring in a sense of discipline and focus. Before reading balance sheets and investing you need to make sure your outlook and mindset is that of an investor. Never let ego, arrogance and over-confidence control you- not just as an investor but also as a human being. You will never have internal peace if you are unable to look at everybody around you with love, compassion and understanding. Irrespective of who the person is, he or she can teach you something you don’t know. I have learnt so much from people all around me and I wouldn’t have been able to learn all these wonderful things if I had not spoken to them with a smile. I would also like to thank all fellow Happionaires who sent me so many lovely e-mails from all across the world after going through our new Happionaire website. Many of you who are based outside India have been asking me how you can get your copy of ITHW. At the moment the only way that can be done is for you to shop for it online once it is out and then have it shipped to you from India. However looking at the incredible response, we are looking for distributors all across the world. If you are interested in helping out with distribution outside India in any possible way, do let me know. 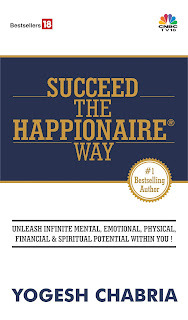 It is really touching and humbling to see such a wonderful response from all of you even before Invest The Happionaire™ Way hits bookstores. It means a lot not just to me, but everybody who believes that life is about doing good, smiling, being happy and that knowledge is truly priceless. It is rare to read such wonderful thoughts these days. Everybody has so much air in their head and think others are not good enough. I am so happy that you are sharing such pure thoughts and letting people know that in order to move ahead you don't have to be arrogant. I am very happy that many more people besides just me are smiling and being motivated by what you write Yogesh. Sir I am so happy that I found you. Since I have been reading your views I have become much more happier and saved a lot of money by not doing panic selling and buying. Earlier I would look for hope by watching TV and analysts but you truly have helped me a lot. I will be buying not just a copy for msyelf but will also get copies for my loved ones. I find it strange how people are willing to lose lakhs of rupees but when it comes to reading they are not willing to spend a few hundreds or thousands. I have already booked my copy with my local bookstore. Yogesh we all need to learn from you how to not to be egoistic. Sadly I do sometimes have some ego, but after reading your views I am realizing that ego is not at all good. You are so down to earth, friendly and approachable in spite of having achieved so much. I am so happy to be a Happionaire and you do make me smile too. I'm glad that all fellow Happionaires agree with it. You have a great blog Dharma! Keep up the good writing and keep sharing ideas! I just read ur article on moneycontrol.com a couple of minutes ago and immediately wanted to give this feedback. I am really touched by the simplicity of the article. Simplicity, ethics and an ability to learn and never look down on others are the virtues we do not commonly encounter nowadays. If we follow some simple rules, not just in investing but in every aspect of our lives, the simplicity with which we can acheive the most impossible of targets/tasks is surprising. PS. I have bookmarked this page. Hi! Nice to read the thoughts. Rare in these days where people are so self-focussed. As cliched as it may sound - humility and work ethics - is mantra to success! I have just subscribed to your newsletter and hope to read some more of your thoughts. On another note - During my masters, I studied a lot of value investing (Banjamin Graham & Warren Buffet) and over last 7 years, I have seen those principles/theories proven right again and again. I guess more and more people should atleast read the philosophy (if not follow it) and I am sure, it will lessen the pain of such market swings. Ajit, Nik and several other fellow Happionaires who e-mailed me regarding this post, it is really nice to know that there are so many of us who believe in the same values and share the same morals and ethics. It is said that every great thing starts with thoughts. Let us together make it our goal and mission to spread the same values and ethics that are so normal and natural to all us human beings. We need to realize that the best investors and people who succeed are able to attract wealth and luck because of their basic quality of being good. True wealth and happiness is what we all need to strive for. Keep reading and keep sharing your wonderful views!